You can take scrap metal to the landfill or a scrapyard. Scrapyards pay for new and old metal, which they can recycle into new material. 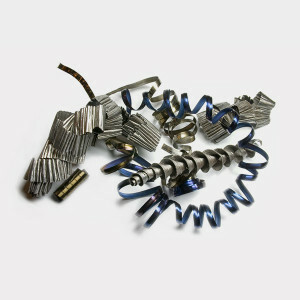 It’s helpful to separate ferrous from non-ferrous metals before visiting a scrap yard. Ferrous metals include steel, pig iron and other iron alloys, while non-ferrous metals are practically iron-free. If a magnet sticks to metal, it’s ferrous, and if not, it’s non-ferrous. Try using the iScrap App to find local scrapyards and which metals and materials they accept. Items that are commonly accepted include metal tubing, wiring and assorted auto parts. On average, more than 250 billion pounds of scrap metal is recycled annually in the U.S. That’s the same weight as 70 million cars. With more recycled scrap metal in the market, less resources need to be mined because recycled metal is a quality supply chain.